The white butter cake recipe makes a thick batter in order to suspend all those mini chips throughout the baked cake. Be sure to use cake flour (well sifted) for this recipe. Regular all-purpose flour could yield a dense undesirable result. The cake layers are sturdy, yet cottony in the centers. I wouldn't hesitate for one second to make this chippy cake into a many-tiered wedding cake. I've also been calling this cake 'Thousand Chips Cake'. I mean - check out that chip-bespeckled slice! I'd never made chocolate chip cookie dough frosting before, and now that I have I'm hooked! 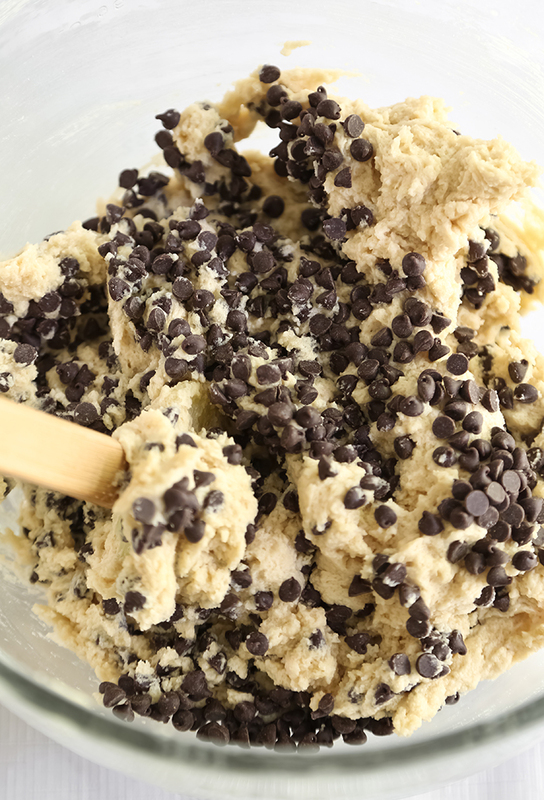 It's basically eggless chocolate chip cookie dough that has been thinned with heavy cream. This recipe uses flour as an ingredient. If you're concerned about consuming the ingredient raw, toast it in the oven on a baking sheet at 350°F for 4 to 5 minutes before using. The boiled milk frosting definitely gives this cake a creamy - dare I say 'wholesome' - milk custard flavor. I find it easiest to make this frosting on a standing mixer. I've made it using a hand mixer before, and in my experience it takes about 5 to 7 minutes for the sugar to dissolve evenly. That may not seem like a long time, but when your arm is craned over a large mixing bowl it can become uncomfortable rather quickly. This party-ready cake will serve up to 20 people. Because of its richness and texture, I prefer to serve it in 1/2 to 3/4-inch slices. It freezes well if wrapped properly and stored in freezer bags. 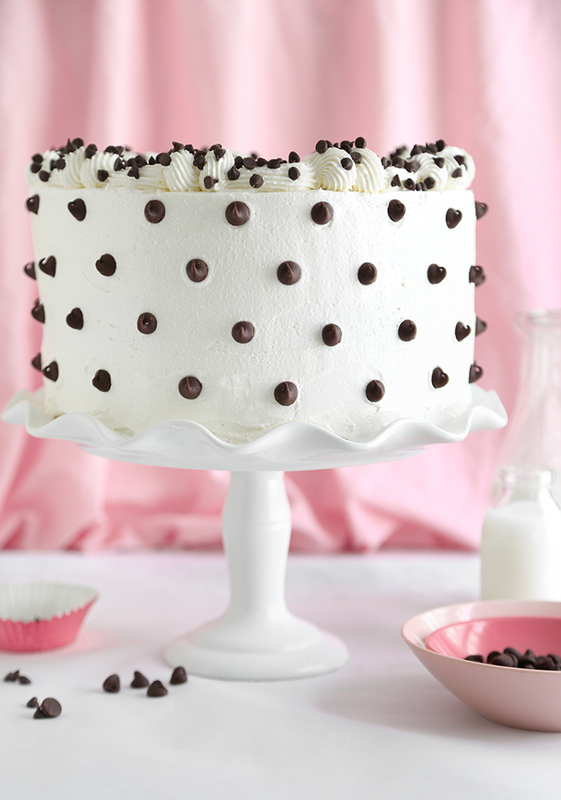 Be sure to use mini chocolate chips in the cake batter. They will disperse and suspend best; larger chocolate chips will sink to the bottom of the pan. Fine grain caster sugar is recommended for the boiled frosting as it dissolves easily. You can usually find this in the baking aisle at the grocery store, but if you’re coming up empty handed, you can make a close approximation at home. Place regular granulated sugar in a food processor and blend until fine. Make the cake layers: Preheat the oven to 325°F. Coat three 9-inch baking pans with vegetable shortening or flour-based baking spray (I like Baker’s Joy) and line the bottoms of the pans with parchment paper. Beat the butter, oil and granulated sugar together in a separate large bowl until light and fluffy. Add egg whites one at a time, beating well after each addition. Beat in the flour and buttermilk alternately with the mixer on low speed; begin and end with the flour. Scrape down the bowl as needed. Gently fold in the mini chocolate chips. Divide the batter evenly between the prepared pans. Bake for 35 to 40 minutes, or until the cakes spring back when pressed in the centers. Allow the cakes to cool in the pans for 10 minutes, and then turn out onto wire cooling racks to cool completely. Level the tops of the cooled cakes with a large serrated knife or a cake leveler. Edit 7/16, Optional: Make the sweet cream syrup. In a saucepan combine the sugar and cream. Cook over medium heat until the mixture is steaming but not boiling and the sugar is melted. Remove from the heat and let cool. Add the vanilla. Use this syrup to brush the cake layers for extra moisture. Make the filling: Beat the brown sugar and butter together in a bowl with an electric mixer until fluffy. Beat in the vanilla extract. Add the flour and salt and mix until combined. Add cream a little at a time until the mixture is spreading consistency (you may not have to use all of the cream). Fold in chocolate chips. Place a cake layer on a serving plate or cake stand. 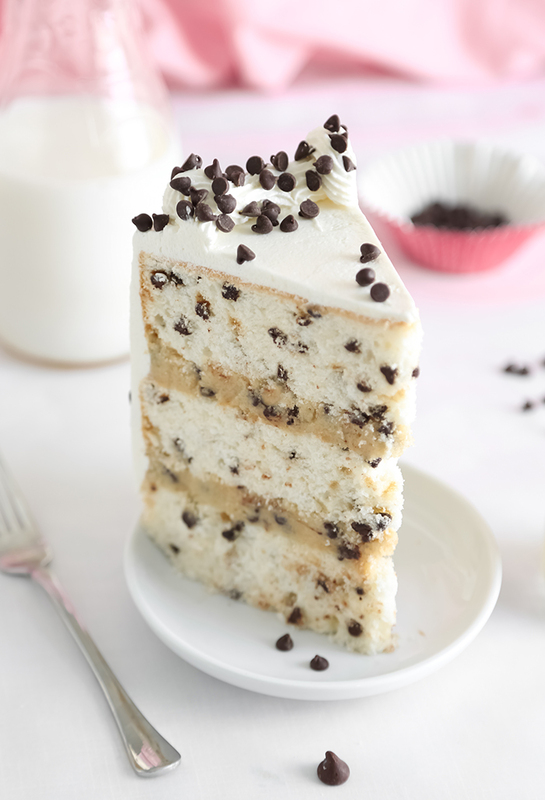 Cover the layer with half of the cookie dough frosting and top with a second cake layer. Cover the second layer with the remaining frosting. Place the remaining cake layer on top. Make the frosting: In a medium saucepan, whisk together flour and 1/2 cup of milk until smooth. Set over medium-high heat and let cook for 3 minutes, or until slightly hot. Whisk in remaining milk and salt. Whisk constantly until the mixture has thickened to the consistency of unset pudding (this can take up to 10 minutes). Remove from heat and pour the mixture into a shallow dish. Place in the refrigerator until cool. When cool, mixture will be thick like custard. In a large bowl (or bowl of a stand mixer, if you have one) beat the butter and sugar together until fluffy. Add vanilla and mix well. Beat in cooled flour mixture one tablespoon at a time on medium-high speed. When all the flour mixture is added beat on high speed until light and fluffy, about 6 minutes. Rub a little frosting between your fingers, if sugar granules remain, beat for 4 more minutes, or until granules cannot be detected with fingers. Decorate: Frost the entire cake with the milk frosting in an even layer; transfer leftover frosting to a piping bag fitted with an open star tip and pipe swirls or stars around the top edge of the cake. 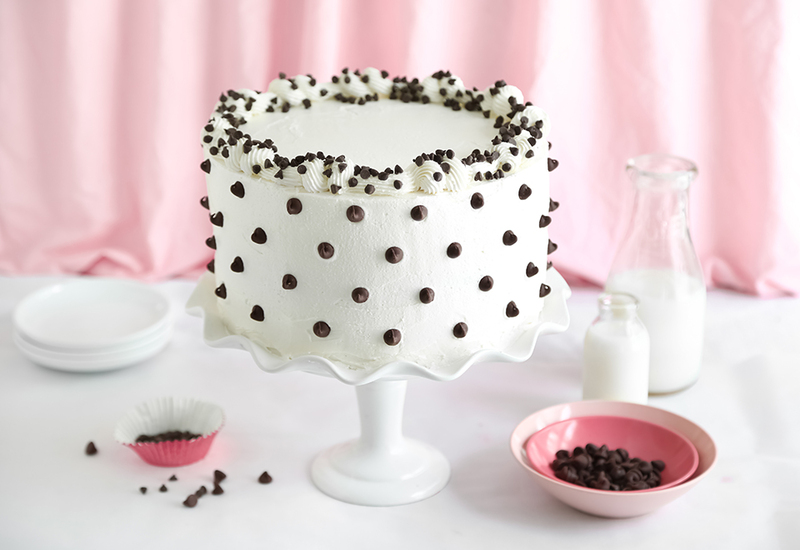 Use regular-size chocolate chips to decorate the outside of the cake. Place chips in staggered lines around the outside edge, beginning at the top and working your way down. Decorate the top edge of the cake with the mini chips. Besides looking so charming and cute, it looks delicious! Can't wait to try it! This cake combines a few recipes that are new to me. Excited to try all. Will put some cookie dough chunks in my next cake batter shake. Thanks for the inspiration! Very appealing, and yummy I bet. Will definitely make it...thanks! This cake was a delicious aspect. This is the coolest cake flavour of life! That filling!? OMG. This is awesome!!! I must make this. I agree, that's a lot of choco chips which I like. 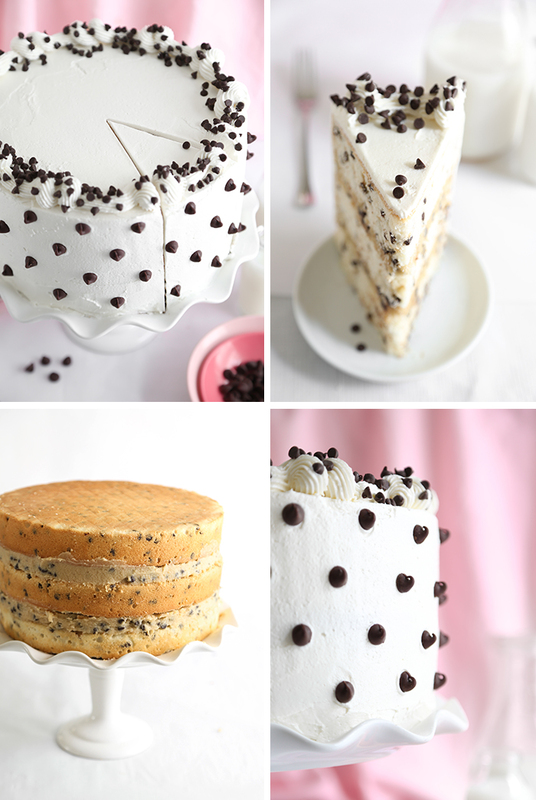 I love that choco chip dough filling, this has to be the best choco chip cake. And, it's sooo gorgeous! This looks fantastic! Do you know if the boiled milk frosting will work with almond milk? I've never made boiled milk frosting with almond milk before, but it sounds like something worth trying! I would venture a guess that, yes, it would work because all kinds of puddings and custards can be made with almond milk. I think the flour may need a little help from 1/2 tablespoon of cornflour. I fear the almond milk may not thicken as easily as rich milk solids. I realize that's a very long answer that essentially means 'I don't know', but I'm glad you asked. Now I want to try boiled almond milk frosting. I'll be sure to let you know when I do! I use 1 tablespoon white vinegar to 1 cup of whole milk. Let the mixture stand until it thickens slightly before using. It may look curdled, but that's okay. Thanks for asking! This looks perfect your cake is so white. 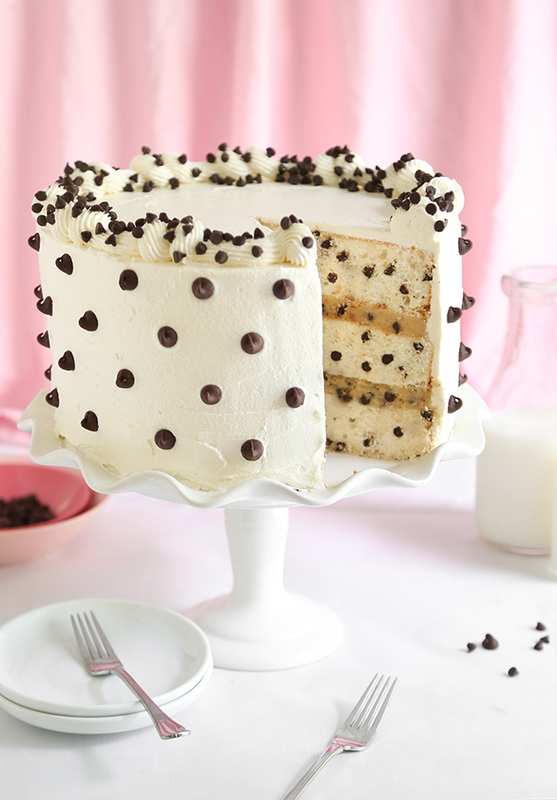 I just adore chocolate chip cake. Hi Heather, I am really intrigued by the frosting. Do you think I can color it with gel food coloring? Thanks! Hi Heather! I'm making this cake tonight for a birthday party - think it's OK to use confectioners sugar instead of caster sugar? Thanks! Hi! I've never tried making it with confectioners' sugar, so I can't say for sure. I suspect it will work, but you may not need to use then entire 2 cups. I'm just thinking of the cornstarch and anticaking agents in the confectioners' sugar - it may make the frosting too thick... but that depends on the brand you are using. You can always thin the frosting with a little cream. I often whiz regular granulated sugar in a food processor to make it fine like caster sugar - so that may be an option for you. Just tried making this cake and altough very yummy my boiled milk icing was very soft, looked a bit like scrambled egg and was melting as I was decorating, where did I go wrong?!? So sorry you hit a snag with the frosting! It's hard to say what happened - perhaps the surrounding temperature was too warm and that's why the frosting didn't firm. If the humidity is high, then it can certainly cause frostings to break. Fondant should work well on top of this cake. The cake's texture is certainly sturdy because it has to suspend all those mini chips. My result was firm but not dry. You'll have to level the cakes before stacking and frosting. I suggest you taste-test the cake scraps leftover from leveling to gauge whether or not you'd prefer a moister cake. You can certainly add a syrup if you choose. Beautiful cake!!!!! Always with great ideas!!!!! I want to make it so bad!!!! Since it is summer here shall I put it into the fridge? Yes - I suggest storing it (well covered) in the refrigerator. Bring to room temp before serving! Just finished making this cake...beautiful! My husband declared it a winner. Absolutely love this icing. Made this cake today. My husband declared it a winner. Absolutely love this icing! Are all the chips semi-sweet? Such a gorgeous cake! I love how the inside mimics the outside. I have a question about the butter... in two of the parts you specify Unsalted Butter, and in the cookie dough filling you just call for Butter. When you just write Butter, do you use Salted Butter? Thanks! Hi Somersly, I use unsalted butter in all baked goods unless I specify 'salted butter'. I usually try to write 'unsalted butter' each time, but darned if I didn't miss this one! Thanks for asking. Unsalted. Such a beautiful cake! I love the cake and the boiled milk frosting, but I personally found the cookie dough filling quite dense. I remember you mentioning not having much experience with cookie dough frosting before, and I have made it multiple times for a popular cake. May I suggest making more of a cookie dough frosting, rather than a dough? I made more of a frosting, with butter, brown sugar, confectioners sugar, milk, and vanilla. While the cookie dough filling was quite tasty, I just found it too dense with this cake, and preferred a lighter filling. The cake overall is insanely good, just a small suggestion! Glad you enjoyed the cake! Thanks for the feedback! Any recommendations on how to make the filling less grity? I have made 2 batches and both were very grity. I tried adding more cream ,but no less grity. Cookie dough is going to have a brown sugar crunch. If you're looking for a smoother filling, such as frosting, then I suggest the following recipe for this cake: 1 cup unsalted butter and 4 cups confectioner's sugar beaten together, gradually add 1/4 cup molasses. Add milk or cream as needed to thin. Fold in 1 cup of mini chips. Thank you for trying the recipe! I'm sorry you found the cookie dough to be gritty. You could always salvage it by adding 2 eggs and baking the dough into cookies. This cake looks so yummy! I would love to make it for my son's birthday cake but I'm wondering if it would work well as cupcakes? Hi Amber, I think this recipe would work well in cupcake form! You could even fill each cupcake with a spoonful of cookie dough. Thanks for asking! Getting ready to make this! Can I make the frosting ahead of time and keep it in the fridge until ready to frost? Maybe a day or 2? Getting ready to make this! Can I make the frosting ahead of time and keep in fridge until ready to frost? Maybe a day or 2? I made this cake for my granddaughter birthday party and I must say it was very pretty. I cut into the cake and it was not really moist and not really dry, kind of an in between type of cake texture. If that makes sense. I loved the filling and the frosting. I'm not sure what happened. I would try it again but it is not a cheap cake to make so not sure if I will make it again. Thanks though! Just made this for my son's birthday and it was good EVEN though I put two extra sticks of butter in the batter! :S My husband and I could tell, but the 5-year-old birthday boy didn't notice. All the adults present were impressed with how pretty the cake was, even though it was like a Pinterest fail next to how beautiful yours is! Thanks for the inspiration! As a mom of four young ones, I rarely get a chance to make beautiful things. Just made this for a dinner party. It was incredibly rich, neither my husband and I could put away a full piece and we are both very big dessert people (read: uncontrollable sweet teeth). I think you could get WAY MORE than 20 servings out of this beast. Also, doesn't fit in a standard cake carrier, for those who are wondering. Cake was slightly on the dry side, as other commenters have pointed out, and I agree that it was missing something flavor wise (I echo the other comments that vanilla would have helped. The texture was light and soft and melt-in-your mouth, so that was nice. I didn't love the flour/dough feel in the filling, but it was decadent. And yes, it is a super expensive cake to make, not to mention time consuming. But it was a fun project and I'm happy I made it!! Do you know how many cupcakes this would yield? Hi! I've never made it as cupcakes. I'd say it'd make about 3 dozen or more. I pin this one on my pinterest account serve as a reference for learning. I also pin the list of easy to do cupcakes for bdays in case...so far tiring doing the concept but i feel optimistic, happy what i am doing , knowing it will come to fruition. can you also follow me in pinterest? if its ok? Made this cake. It looked amazing....however, the cake itself wasn't much to be desired. I read the comments about the cake being dry, so I utilized the sweet cream syrup. Unfortunately, it did not help the extreme dryness of the the cake. I made this for my son's 15th birthday per his request. He tried so hard to eat it, but I told him he didn't have to; I knew it was dry. The filling was good, but a little too much salt for my taste. The frosting with the bomb! Favorite part of the cake. Not extremely sweet like buttercream and very stable. I was concerned, when initially reading this recipe, about the chocolate chips staying in place on the outside of the cake, but to my surprise, they stayed on with no sliding. So, to not waste this cake, I transformed it into a trifle. Deconstruction of the cake went very well. I made a traditional simple syrup with vanilla and doused the crumbled cake layers in the trifle. I took it to a family function where it was gobbled up! I just made this cake for my brother-in-laws birthday and it was one of the best cakes I've ever had. I accidentally started baking it at 350 and baked the first two layers for 35 minutes. The third layer I baked by itself for 30 minutes and it was perfectly cooked. I used the syrup and this cake was perfectly moist. I did reduce the salt in the filling and only used 1/2tsp which was perfect. I had half a cake left after serving 11 people. The cake was 6.5" tall when frosted and 11lbs! Definitely one of the biggest and best cakes I've made. I just tried this too. Loved the frosting and filling was good, although might adjust that slightly next time. But the cake was terrible. Way too dry. Couldn't take more than a bite or two. I think the 8 egg whites are way off for amount. In the future, will do a different cake recipe. If making the cakes ahead of time and then freezing, when would you add the sweet cream? And when do you add it normally? After the cakes have cooled or when they're still warm? Add the sweet cream after the cakes are thawed to room temperature. I usually brush the cakes with syrup after they've cooled a little or are at room temperature. I have been working on this cake for two days. I just made the frosting twice and both times it looks like cottage cheese. I live in Sacramento - I do not have any humidity. any thoughts? I've spent a lot of money trying to make this cake. Hi Heather! I am so excited to make this cake for my boyfriend's birthday this weekend ;) Quick question - can I use 8" cake pans instead of 9"? If so, what adjustments to the baking temp/time would you suggest? Thanks! hey! i will be making this cake (it looks absolutely yum!). I was wondering if i could use white sugar instead of brown in the cookie dough filling? Can you let me know if it will turn out ok? Hi Heather! I made this cake once before and it was yummy but enormous! Do you think it would halve well? Hi heather! Thanks for the great recipe!! I am definitely going to try making this cake. Do you think it would work well with 5 layers? I have the 6 inch wilton easy layer pan set. Thanks! I wanted to let you know how special this cake recipe has become to our family. About three years ago we decided to start making my daughter's birthday cakes at home. She enjoys the baking process, and my husband's mother decorated cakes for years. So, I sent her off on a Pinterest search and this is where she landed. At first I was intimidated. Three layers? Chocolate chip cookie dough in between them? "Ummm, don't you like this other cake?" But in the end, we pushed through and memories - good memories - were made. So, I'm here again to get the recipe and make it for her birthday. It's all she wants, and it's all her friends want, to eat for her birthday treat. Thank you for sharing your talents with others! It is appreciated. Hello dear, ur cake looks insanely beautiful & yummy. I want to make this cake for my son's second birthday party as he is a huge fan of chocolate chip cookies. Just a quick question, can I make this cake in a half sheet cake pan as its a train theme party? Should i double the recipe for baking in a half sheet baking pan or use the above quantity in two half sheet baking pans? Can I use whipping cream instead of heavy for the cookie dough? Hi I have a question would I be able to use a edible sheet on this frosting?